A tanda is a set of three to four songs of either tango, vals or milonga* (style of music) played in a milonga* (a tango party). Usually tangos are always played in tandas of four songs while valses and milongas are more commonly (not always) played in tandas of three songs. A normal order of tandas is two tandas of tango, one tanda of vals, two tandas of tango and one tanda of milonga. In milongas the dj will play a tanda followed by a cortina (a short song of different style) which will mark the ending of the tanda. During the 30-90 second cortina the dancers will leave the floor and start looking for their next partners. After the cortina finishes the dj continues with another tanda and after finding a new partner the dancers will get on the dance floor again. It is preferred that a tanda consists of songs from the same orchestra, style and time period. This rule is made having the dancers best interest in mind. When the Dj follows this rule the dancers can recognise from the first song of the tanda if they want to dance to the tanda and then choose who they would like to dance it with. For example if the first song is a smooth romantic tango from late 30's from for example Francisco Canaro, the dancers can expect the same style to continue throughout the tanda. 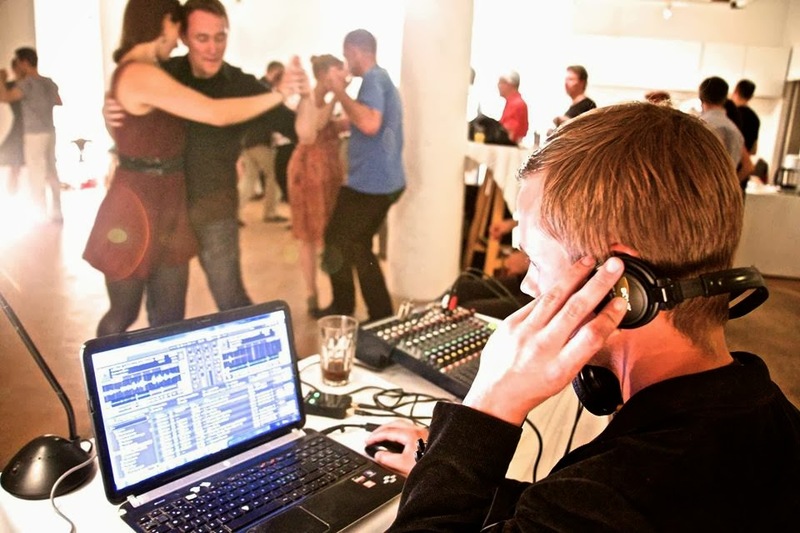 If the Dj doesn't follow this rule then the dancers don't know what to expect and dance in fear of having to leave the dance floor when the romantic mood might be broken by for example a randomly selected dramatic uptempo tango. Even though the song itself would be a great one, such change of mood and style (possibly even orchestra and time period) is too drastic and will destroy the mood and a lot of dancers will leave the dance floor and complain about the Dj'ing. The Dj also should play a lot of tandas which have songs that are well known and popular. These are the songs that are played over and over again in milongas everywhere and the dancers know them by heart. The better the dancers know the songs they are dancing to the better they can interpret and dance the music. Playing too many tandas of more unknown tangos will leave the dancers feeling uncomfortable. There's a saying that all the dj's play the same 200-300 tangos just in different order. This is very true in some ways but in every milonga there's also space for tandas of less known tangos and a lot of possibilities for personality and creativity in how you organize your tandas and when you choose to play them. Another important thing in creating tandas is choosing in which order to play the songs. The first song is very important in describing the mood of the tanda and it also needs to be one of the, if not the most danceable song of the tanda making sure everybody wants to get on the dance floor. The second song should continue the same emotion and quality as the first one. The fourth song has to be the best song of the tanda or second to only the first one leaving the dancers in a good mood after the tanda. The third one could be considered as the least important of the songs but it doesn't mean you can use any song you like on this spot. In fact sometimes the third song is of great importance to the tanda. For example if I've played two uptempo songs I might drop the tempo a bit for the third one to make the final uptempo song stand out more and also give better structure to the tanda. A bit of a curve in the emotions even inside a tanda can be good. If you play a tanda of very dramatic tangos the dancers will get very deep in this emotion and it can be tiresome to keep the same intensity of emotion for four songs. Again the third song could be "mildly less dramatic" to give the dancers a bit of a breather without breaking the mood. This is my view of a good basic structure for a tanda. However you can play around a lot with the dynamics of the tanda and think about how you can get the strongest tanda for the right moment. Sometimes the perfect tanda for one moment is not the perfect one for the other. Sometimes changing the order of the songs or changing one of the songs to another one makes a huge difference. These days I usually prepare tandas of 5-7 songs and then during the milonga choose which four I will play at that moment. During the milonga the dj should play tandas from all the most popular orchestras like D'Arienzo, Pugliese, Caló, Di Sarli, Tanturi, Troilo, Biagi and D'agostino as well as some Fresedo, Rodriguez, Lomuto, Canaro, Donato, Orquesta Tipica Victor and others. A good Dj can sense the emotions of the dancers and choose the right tandas for the right moment and will know which tanda to play after the other. In the beginning of the milonga it is good to play lighter tandas with good energy and save the most melancholic and dramatic tandas to be played later during the night. I often try to finish the night off with a very romantic tanda in the style of "the last slow songs of the night". It is also a common practice to always play a version of "La Cumparsita" as the very last song of the milonga. The Dj has to aknowledge the expectations of the dancers and fulfill them. No... the dj needs to surpass them. But be careful as thinking you know and understanding what the dancers need are two different things. I always think that whenever you try to get too original you have to have alarms going off in your mind and think through thoroughly what you're about to do. Make sure your music is in high quality format and sound quality. Try to play only the songs in good quality and keep looking for better quality versions of the ones you'd like to play but can't just yet. Take time before the milonga to try out the sound system and how your music sounds in every location you play at. Try different songs from different orchestras and time periods for the sound check. Learn how to use an equalizer and ask the organizer to provide one or bring your own (external or use at least Dj software like Traktor which includes a good EQ). To learn more about sound quality, check out my post about sound quality on tangovalsmilonga.com. Please add Fresedo to your list. On what I hear at milongas, he is certainly more popular than Pugliese, who you already have on the list. Vous ne dites rien sur les tangos nuevos et tango electronique. Il y a aussi l'ordre au cours de la soirée pour passer les orchestres. Thank you very much for this all! very mediocre DJ with little sense of the quality of music. If you want to go deeper in your analysis and feedback, I'm all ears. Very useful info on here and some beautiful tandas. Allow me to give you a tip in return for all this: DJs has no apostrophe.